The 2018 NAB Show begins in just days at the Las Vegas Convention Center. The annual show brings together the media, entertainment and technology (known as “M.E.T.”) world for diverse discussions and insights into where the broadcast world is headed alongside the largest trade show for new equipment, software and hardware for production. 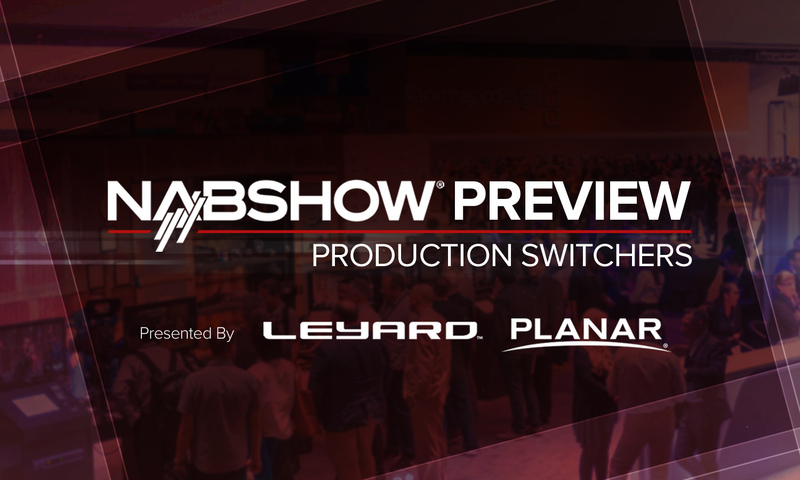 Along with our extensive coverage of all the pre-show news and announcements, the top sessions to attend and even the best NAB Show parties; we’ve prepared a series of NAB Show Preview articles to help you plan your show floor experience, brought to you by Leyard and Planar. This guide covers production switchers. From small streaming operations to enterprise clients, this list includes an assortment of companies who can help. We hope you’ll use our guide as a starting point for your show schedule alongside the “Map Your Show” tool from the NAB Show. Blackmagic Design will showcase a range of new broadcast cameras this year at NAB along with new ATEM switchers. A high frame rate Ultra HD 2160p60 switcher, ATEM 4 M/E Broadcast Studio 4K has 20 inputs, 4 M/Es, 16 next generation ATEM Advanced Chroma Keyers, 2 Ultra HD multi viewers, full 2D DVE, built-in SuperSource compositing engines with 4 picture in picture DVEs, full re-synchronization on inputs and more. ENCO and Broadcast Pix will showcase a fully integrated, affordable TV newsroom workflow at the upcoming 2018 NAB Show, which integrates ENCO’s MOM (Media Operations Manager) automated video playout with Broadcast Pix IP-based integrated production switchers. EVS will highlight new updates to its Dyvi line of software-defined production switchers during NAB. FOR-A will demonstrate its end-to-end line of video production tools and unveil several solutions, including video switcher, frame rate converter, routing switcher and IP control software technologies. Grass Valley will highlight new products and update at NAB along with the integration of the Snell Advanced Media (SAM) product line, such as the Kula andKahuna switcher. Located in a new position this year, Ross Video will highlight new updates to Carbonite, Acuity and a new self-contained switcher known as Carbonite Black Solo 13, boasting 13 inputs and 6 outputs. NewTek’s NAB Show highlights include the NDI PTZ1, a production ready PTZ camera, along with the NewTek Connect Spark. Of course, NewTek will also showcase a range of updates to its switcher lineup. Explore more of our NAB Show Preview series to help map your show floor visit, including lighting design, display technology, weather and traffic systems, production switchers, music and much more.